Hands-on learning experience at the source of your drinking water! A powerful learning experience out of the classroom, these field trips are designed for 4th and 5th grade students. We have tailored the content of these field trips to reinforce what the students are learning in the classroom. Over the past ten years, we have led nearly 5,000 students on these fall learning expeditions in their mountain backyard. 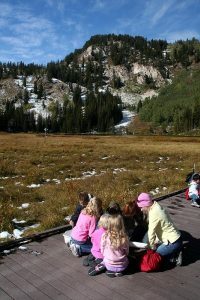 These field trips are co-led through a partnership between the staff and volunteers of the Cottonwood Canyons Foundation, the SLC Department of Public Utilities Watershed and the Uinta-Wasatch-Cache National Forest. On past field trips, we’ve watched moose (from a safe distance! ), discovered mink sneaking glimpses at us from under the boardwalk, spotted trout swimming in the streams, and investigated beaver lodges & dams. Bus scholarships available on need basis. Email education@cottonwoodcanyons.org to schedule–the earlier the better!